Bar railing brackets should only be matched with a similar design style, ie: Ball Pillar to Ball Pillar, this is due to differing heights between styles. Stylish bar railing brackets suitable for tubular handrail and arm rail installations in bars, pubs restaurants and shops. A quick and easy way to add a touch of class and extra comfort to any bar setting. Available in sizes to fit 38.1mm, 50.8mm diameter tube and 35mm x 35mm square tube. Designed for simple installation with the use of a few household tools. All brackets are supplied with screw fixings for direct fixing on to hardwood surfaces. Designed for use on horizontal surfaces only. Do Not use as a handrail wall bracket. 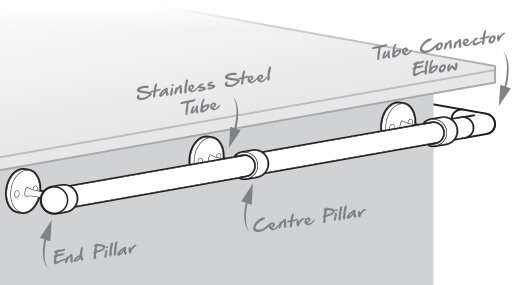 We offer a full range of compatible tube, elbows and end caps available to complete the perfect bar rail.